Substitute Theo Walcott's superb double guided England Under-21s to the European Championship finals. England had been outplayed for most of the game before Walcott twice broke clear to score with exemplary calm. Both sides finished the game with 10 men, Germany losing Markus Brzenska early in the first-half, with Steven Taylor red-carded just before the hour. Gonzalo Castro missed a first-half penalty for Germany, who spurned a number of chances during the match. Walcott showed no such inhibitions after coming on as a second-half substitute in the 74th minute. For each goal his speed allowed him to go clear of the German defence, before he finished with incisive shots, his calmness in front of goal reminiscent of Michael Owen. In a tense encounter, littered with yellow and red cards, England had to ride their luck to reach next summer's finals in Holland. Germany should have pulled level on 22 minutes when they awarded a penalty - referee Jaroslav Jara ruling Taylor had fouled Mario Gomez. 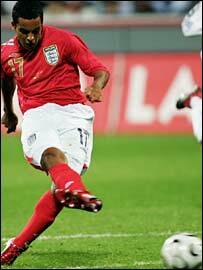 But England were reprieved when Castro screwed a right-footed penalty wide. In the second half Gomez went close with a flicked header from a corner, while Micah Richards made a miraculous goal-line clearance. "I'm very proud of the team. "I knew Theo Walcott had fresh legs and knew he could score. Those were two fantastic goals, and I'm delighted for him and delighted for the team. "I'm proud of the way they have prepared in the last week. It's been an absolute credit to them." Germany U21: Rensing, Reinhardt, Ochs (Freis 83), Brzenska, Hilbert (Dum 69), Castro, Boateng, Polanski, Kiessling, Hunt, Gonez. Subs Not Used: Tschauner, Kruska, Otti, Schonheim, Tasci. England U21: Carson, Richards, Baines, Steven Taylor, Ferdinand, Huddlestone, Reo-Coker, Milner, Agbonlahor (Walcott 77), Nugent (Hoyte 67), Young (Jerome 90). Subs Not Used: Alnwick, Kilgallon, Watson, Routledge. Sent Off: Steven Taylor (59). Booked: Reo-Coker, Steven Taylor, Richards, Ferdinand, Baines, Carson. Ref: Jaroslav Jara (Czech Republic).